One of the best things you can do for your cat is give him regular head-to-tail check-ups at home. Even if you don't know what you're looking for, simply getting him used to being handled will help enormously at the vet. What's more, those home check-ups mean you're more likely to notice a problem with your cat should one arise. 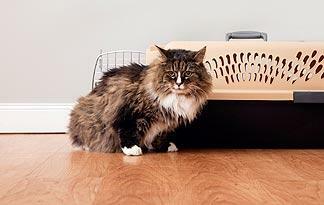 Another very important stress reducer is getting your pet is accustomed to being in a carrier. If he only gets into the carrier to see the vet, chances are he'll resist it. Instead, create a link between the carrier and fond feelings by incorporating the carrier into your daily lives. Let your cat use it as a nap space and offer treats when he's inside. You could also try occasionally leaving it open on the living room floor, incorporating it into playtime with your favorite feline friend. Going to the vet is inevitably going to create some stress and anxiety in your cat. You can reduce this by offering plenty of love and affection before the trip. It may help calm you too; studies suggest that petting and playing with pets can reduce stress levels in humans. This is a great ritual for the hour before your vet visit. You and your pet are both going to need to be as chill as possible before getting into the car, which felines would probably call the "purring tank of terror," if they were actually able to speak.